In this post, we examine what is needed to deploy OSGi in a regular Servlet Container using the Equinox Servlet Bridge. We also use the Servlet Bridge to deploy our OSGi cache using Tomcat and wrap it up all together in a standalone WAR archive. Please read the previous installments to get up to speed and see the source used in this post. Firstly, we need to setup some kind of project to hold all that is going in the WAR archive. This can be done using the WTP (Web Tools Project) or just as a regular project. In this case we do it using a plain-vanilla resource project but feel free to use WTP as the basics are the same. So firstly we create a resources project to hold the stuff, named ‘com.calidos.dani.osgi.cache.package’ for instance. Secondly, we create the folder structure we need to hold all the files that need to reside in the final WAR webapp, so we create a WEB-INF folder to hold all the classes, libraries metadata and configuration. We also know we need a web.xml file to define all the servlets this webapp declares. This is where the Equinox Servlet Bridge kicks in. It provides a Servlet that loads up the environment as well as forwards any HTTP requests onto our OSGi-managed Servlet instances. We check the Equinox in a servlet container article and learn what the bridge Servlet is called, what parameters it can take and any other web.xml details we need. We also add two parameters (more information and additional options can be found on the FrameworkLauncher servlet bridge class and the Equinox documentation). As we can see, there are just three classes which compose the servlet, a special classloader and finally a class that launches OSGi. We take this JAR archive and save it in our package project WEB-INF/lib folder. We also check the composition of the file to make sure it includes all the classes we need. This takes care of the plain webapp side of things so we move onto actually loading OSGi and what configuration it needs. As mandated by Equinox we add a launch.ini file to clear and possibly override System properties (please see the source for details on that). 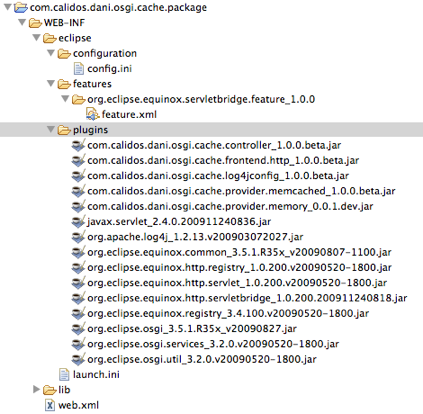 We then create an eclipse folder, which the servlet bridge expects to find the OSGi platform jar and any bundles (including ours). 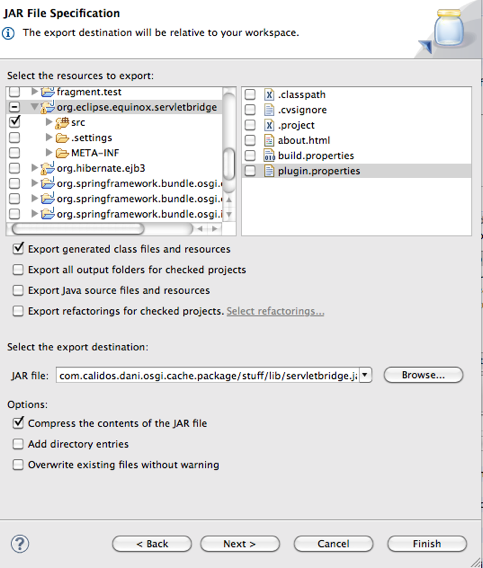 We select all our project bundles, right-click and select the ‘Export…:Deployable plug-ins and fragments’ option. For expediency, we can go to our Eclipse installation folder and look for them in the ‘plugins’ subfolder. We then copy them into our package ‘plugins’ folder and there you go. The second option is to get them from the Equinox distribution. Once that is loaded onto our workspace, we open the feature.xml and select the ‘Export Wizard’ form the ‘Exporting’ section. This lets us export these minimum bundles and generate both the deployment ‘feature.xml’ file as well as the bundle listing (even though the wizard actually takes them from our Eclipse platform). These can also be obtained from the Eclipse plugins folder or Equinox distribution folder. One should note that modifying the feature.xml taken from the Eclipse CVS repository, adding any required plugins there and then running the Export Wizard. In the first case, it’s a special minimal bundle that hooks the plain webapp servlet bridge with the OSGi ‘org.eclipse.equinox.http.servlet’ standard component which publishes a servlet service onto the OSGi platform. We export it as a deployable plug-in and add it to the mix. We can also download it from the Equinox distribution site as well. In the second case, this bundle contains the basic servlet classes and interfaces and I have found problems of class signatures when using 2.5 along with the servlet bridge so unless all is compiled against 2.5 the safest bet is to go with 2.4. 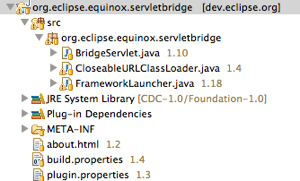 (Check http://www.eclipse.org/equinox/documents/quickstart.php for more info). Next, Equinox requires an XML file to define some metadata about the loaded bundles and make our configuration easier. The file sits in a folder called ‘features’ plus a subfolder with a reverse DNS name and is called feature.xml. We complete the list with all our bundles, fully knowing that we can extend our environment on the fly once it’s loaded if we need it. Next, we create the config.ini file which really tells equinox which of the bundles stated in the feature file to start, at which start level and lets us add even more bundles (though we need to specify where the actual file is located and the full filename in that case). It also lets us configure the environment pretty thoroughly. We decide not to start the in memory bundle as it only works reliably in a single instance deployment scenario. Otherwise, in a multiple server setup the in-memory cache data would become inconsistent. Also, be sure to check the Equinox quickstart guide and documentation for more information. Time to right-click on the project and select ‘Export:Archive file’ to save it in zip format and rename it to .war. Ready to deploy! Remember to access it using the URL //cache/. In web.xml the ‘-console 6666’ parameter means that doing a telnet on port 6666 of the machine initiates a session within the OSGi console. WARNING: there is absolutely NO SECURITY so disable, firewall or ACL that port NOW. As usual, here you can find the source and the completed WAR though they are one and the same. This entry was posted in Computing, Java and tagged Equinox, Java, java servlets, osgi, tomcat. Bookmark the permalink.